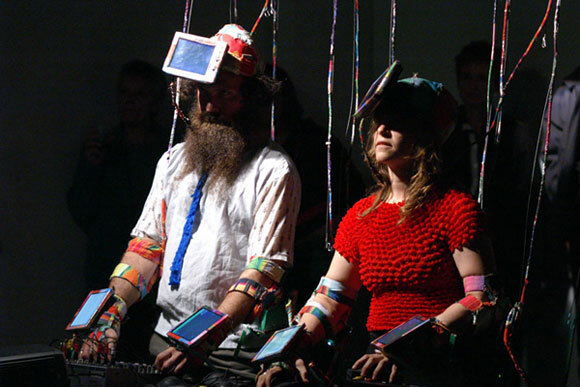 Rhizome | Blog Posts tagged "LoVid"
Michael Connor | Mon Jun 17th, 2013 11:25 p.m. Promotional video for Lovid, U R QR (2013). This weekend, artist duo Lovid will premiere a new project titled U R QR. If you participate, various things will happen to you, including your face being painted in black and white blocks and then photographed; when combined, the resulting images will combine to form a functioning QR code. QR codes have been waiting for a really good art project to come along for a long time, and this could be their big moment. Leila Christine Nadir | Thu May 31st, 2012 11:28 a.m.
Jason Huff | Mon Aug 15th, 2011 11:14 a.m.
LoVid is a 2011 Rhizome Commissions winner for their proposal, iParade: Unchanged when Exhumed. Given your interest in revealing electronic circuitry and conduits as a symbol of the body, do you feel that your wearable pieces like Coat of Embrace are extensions of your own body's natural electric currents? Also, reflecting on early sci-fi and cyborg culture, what is your future vision of human interactions with electronics? All of our instruments, wearable or not, act as extensions of our bodies. Our tactile relationship with the technologies that we use includes building our instruments by hand and designing them around our bodies. Despite or as a result of their origins, these instruments modify how we move while we play them, in ways we cannot predict in advance. They change not just our use of technology, but also the communication between us and our audience during the performance. In some of our work, we amplify natural electrical signals from the human body when we invite our visitors and audience to touch exposed electronic components that are connected to our instruments. This allows the live signals from their bodies to affect the final audio/video. We like creating this circuit between natural and man-made signals as it fits with our vision of a conglomeration of media/technology/electricity with natural and organic systems. In terms of past/future visions, we tend to think in terms of alternate possibilities for both present and future. We envision co-evolution of natural and man-made systems where interactions are innate and automatic.